This is Part 4 of a series of articles detailing the 21 Things Every Internal Martial Artist Should Know about Chinese Medicine, by Tom Bisio. Virtually everything in the Chinese internal martial arts is congruent with traditional Chinese medicine. All the body principles and alignments are designed to line up the soft tissue, joints and even the organ cavities, so as to maximize free-flowing circulation through the blood vessels and body tissues. Many of the movements common to Tai Ji Quan, Ba Gua Zhang, Xing Yi Quan, Liu He Ba Fa and Tong Bei Quan have the dual purposes of teaching martial techniques with correct body mechanics and simultaneously harmonizing organs and meridians. One of the caveats of this duality is, if you fail to harmonize the organs and meridians, the martial techniques don’t quite mesh properly. Read Part 1, Part 2 and Part 3 of this article. by clicking on the links. 17. The Heart rules the blood and blood vessels and stores the spirit. We know that the Heart pumps the blood, so the statement that it rules the blood and the blood vessels is no surprise. The Heart also plays a part in the creation of the blood. Kidney Essence, and the clear essence from food and drink extracted by the Spleen, go upward to be transformed into blood by the heart. The Heart is said to “house the Shen (spirit).” Shen resides in the Heart, but radiates out through the whole body. The radiance of the Shen manifests through the light, the brightness shining out of a person’s eyes. Shen might be defined as the manifestation of the vitalities. If Jing and Qi are the basis of life, then Shen is the manifestation of that life. In a narrow sense, Shen refers to a person’s mental and emotional attitude, their psycho-emotional state. In a broader sense, Shen encompasses a sense of the energy, concentration, emotional health, engagement with life and even a sense of connection with the numinous. Many mental processes that we in the West relate to the brain, are related to organ functioning in Chinese medicine. This more visceral approach to looking at thoughts and emotions tend to resonate with our own inner sense of thoughts and emotions, and can be a useful tool to understand the ongoing movements and transformations of mind and emotions. The character for heart – 心 (Xin) – can also mean thoughts and feelings. Hence Xin is often translated as “Heart-Mind,” but this idea of the mind includes emotions, feelings, desires, thinking and reflection. It is part of the process of being and transformation that has mental, physical, psychological cultural and social components. More properly, Li that is result of these harmonies is called Jin. Jin refers to a specific internal energetic configuration of power, force, intention and spirit that infuses a movement or series of movements. For example, we can speak of wrapping Jin, shocking Jin or sticking Jin. At their heart, internal arts are method of honing this connection between intention and action so that it is efficient, instantaneous, and to some extent, operates unconsciously. Shen is also very important in understanding the inner cultivation aspects of the internal arts, Nei Gong and meditation. Daoist inner cultivation practices, which are part of the internal arts, work with inter-transforming the Three Treasures: refining Jing and transforming it into Qi/Breath, which then fills, animates and stimulates the body, becoming Shen. This process nourishes life, revitalizing one’s consciousness and very existence. Micro-Cosmic Orbit Breathing and meditation one way of initiating the transformation of the Three Treasures. In order to harmonize the Three Internal Harmonies and in order to transform the Three Treasures, the spirit must be calm and tranquil. Proper cultivation of the Shen and the mind-intention is therefore critical in internal arts training. Much of the foundational practices of these arts – Nei Gong, Zhan Zhuang and the proper performance of basic forms – emphasizes cultivating spirit and intention while simultaneously training the body. The heart-spirit must be tranquil and calm (“well housed”) in order for he mind-intention (Yi) to permeate all the postures and movements. Zhang Nai Qi specifically mentions the importance of form following the intent. He points out that a common mistake in Xing Yi Quan is for the fists to lead the intention in the performance of Pi Quan (Splitting Fist) and Beng Quan (Bursting Fist). Zhang says that the impatience of the mind flies toward the goal, while the body is still only half way there. This mistake also commonly occurs in Pao Quan Cannon Fist), because this fist is associated with the Heart. If the form and intention are not completely fused together (the very meaning of Xing Yi), there is a tendency for this form in particular to agitate and “heat up” the heart. This same lack of integration is also a common mistake in Tai Ji and Ba Gua. The spirit must stay calm, the heart, intention Qi and form must all move together, as one unified entity. 18. The Heart hates heat. The Heart is associated with fire in Chinese medicine. It is the imperial fire of the body. This association is reflected in the ability of the blood to warm the body. Even in English we describe ourselves as “warm-blooded” creatures, and having “warm hearts,” conveying a plethora of meaning that is both physical and psychological. Because the Heart is already warm, it does not tolerate an increase in the internal heat of the body. Just as cold tends to sink, heat tends to rise, Heat tends to attack the Heart and the upper body, often making us feel irritable and unsettled. This happens when we are feverish, but it is also observable in the shortening of tempers that naturally seems to occur in hot weather. This is because heat disturbs and unsettles the Heart Spirit, so rather then being calm and well-housed by the heart, the Spirit floats and rushes upward. This action can create feelings of anger and irritability, or merely a sense of being unsettled. Heat can be generated internally through imbalances of the body or of the emotions. It can also be related to improper posture and body alignment. Chest tension creates a sense of the Heart lifting upward, a sensation that the Chinese describe as “scorched Heart” (xin jiao), in which anxiousness, worry and vexation are evident. In releasing the organs, so that they settle downward toward the lower abdomen, the whole body settles. The lower abdomen is then said to be relatively ‘full’ and the chest relatively ’empty’. Then the Heart is “set downward” (fang xin),  the body relaxes and the Heart is calm. In the heat of Summer one should adjust training to conform with the seasonal energy. The summer is a good time to do more active exercises and training. The body is naturally pliable and flexible in the warmer environment. This is also a good chance to vent excess heat from the Heart by letting it move outward with the sweat. However, one should train early in the morning, before the heat of the day accumulates and one should not train directly in the hot sun. Over-training in the heat can agitate the Heart-Mind and exhaust the body, as Qi also goes outward with the sweat. 19. The Lungs govern the Qi. Through respiration, the lungs rule the Qi of the entire body. The act of breathing is one of the most basic rhythms of the human body. The Lungs inhale the pure Qi of the air and exhale the impure Qi. The rhythmic, bellows-like movement of the Lungs powerfully affects the whole body, moving the Qi inward, downward, upward, and outward. With inhalation, the Qi contracts and descends. With exhalation, it ascends and expands. The pure essence brought in and characterized by the breaths is essential in the production of Qi. The Lungs disseminate Qi out to the skin, the flesh and to the rest of the body via the meridians and blood vessels. Hence the Lungs are said to “go to the hundreds of vessels.” The Lungs also direct Qi downward. A full inhalation can only occur when the Lungs send Qi down to the Kidneys, which in turn “Grasp The Qi.” This is essentially “Dantian Breathing,” or “Kidney Breathing,” the deep abdominal breathing advocated in meditation, Nei Gong and the martial arts. For this reason, natural deep breathing is of paramount importance in the internal arts. These movements of Qi occur in nature and in all living creatures. The proper and appropriate interaction of these eight movements is the mechanism of healthy functioning. The eight actions of the Qi are not just movements. They also encompass the activities, transformations and interactions of the body’s structures and substances (fluids, blood, and Qi). Even the activities of the mind and emotions are regulated by the Qi and its movements. The emotions themselves are in some sense a spontaneous expression of the movements of Qi. All of the internal arts employ concentrated breathing, often in combination with movement, in order to sense and regulate the Qi Dynamic, which is in turn regulated by the organ of breathing – the Lungs. When practicing Zhan Zhuang or Ba Gua Circle Walking Nei Gong (Ding Shi Ba Gua Zhang), we are to some degree sensing the Qi Dynamic, the oppositional and complimentary movements of Qi in the body. If these internal movements are balanced and harmonious, then the movements of the body as a whole are balanced, and the body can move instantly in any direction, because it is already simultaneously moving in all directions, even when one is standing in apparent stillness. 20. The Lungs govern the skin and loathe dryness. The Lungs are said to govern the skin and the body hair. The Lungs are the only internal (Zang) organ to have direct contact with the outside world, through the mouth and throat. The skin also exchanges air through its pores and can be said to “breathe.” The Lungs and the skin, as organs of breathing, therefore have a close relationship, particularly because the Lungs also disperse Qi out to exterior of the body, bringing blood and fluids to moisten the skin and body hair. This outward movement of Qi also helps regulate perspiration and the opening and closing of the pores: “The brilliance of the Lungs is reflected in the body hair.” The health and luster of the body hair is a reflection of the Lungs ability to nourish and moisten the exterior of the body. The fourth of the four extremities is the tongue, which is related to the heart and the flesh. When the tongue touches the palate, body fluid can concentrate, ensuring smooth circulation of Qi and blood. Touching the tongue to the roof of the mouth also connects Ren Mai and Du Mai, and aids circulation of Qi and breath through the Micro-Cosmic Orbit. Because of the moist nature of lung tissue, the Lungs are said to “loathe dryness.” The Lungs are responsible for disseminating and diffusing the Qi throughout the body. Blood and body fluids that moisten the tissues and the skin are carried by the Qi to all the parts of the body, including the skin and flesh. Dryness in particular impedes this action, and therefore the Lung is the organ most affected by Dryness. Dryness, and particularly environmental heat and dryness, chaps the skin and lips and can dry out the nose, mouth, lips, and tongue. Dryness can also cause a sore throat and a dry cough. Improper breathing and too much talking can disperse the Qi and dry out the lungs and the throat. When training in dry hot climates, take care to eat moistening foods that generate fluids, so as to protect the Lungs. 21. Real knowledge of Nei Gong requires a thorough understanding of the channels and collaterals. Once the vessels and collaterals are understood, you must observe the patterns. 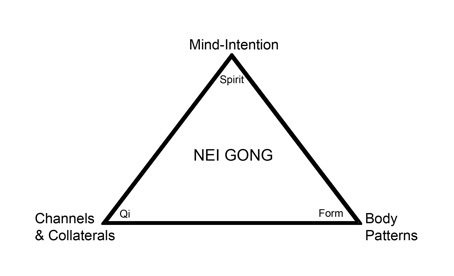 Teachers of Nei Gong and the internal martial arts emphasize three key points that are critical to learning Nei Gong and internal martial arts correctly. It is necessary to have a thorough understanding of the Jing-Luo in order to practice Nei Gong correctly (particularly the eight extra channels). It is necessary to have a thorough understanding of the postures and forms, the internal and external body alignments, and the methods of moving and changing. The mind must be tranquil and calm. The Mind-Intention must permeate all postures and movements. Transforming Emotions with Chinese Medicine: and Ethnographic Account from Contemporary China, By Yanhua Zhang. Albany, NY: State University of New York Press, 2007, p. 58. Vital Nourishment: Departing From Happiness by Francois Jullien, translated by Arthur Goldhammer. New York: Zone Books, 2007, pp. 84-85. The Science of Internal Strength Training by Zhang Nai Qi (1933), translated by Marcus Brinkman. insiderasia.com, p. 18. The Science of Internal Strength Training, p. 28. The Science of Internal Strength Training, pp. 46-7. Statements of Fact In Traditional Chinese Medicine (Revised and Expanded) by Bob Flaws, Michael Johnston and Timothy Rogers, p. 71. Detailed Collection of the Art of Xing Yi Quan by Liu Dan Chen (Liu Wen Hua). Translated by Huang Guo Qi and Tom Bisio. Detailed Collection of the Art of Xing Yi Quan. Nei Gong: The Authentic Classic – A Translation of the Nei Gong Zhen Chuan, translated by Tom Bisio, Huang Guo-Qi and Joshua Paynter. Outskirts Press Inc, 2011, p. 3 and 7. Nei Gong: The Authentic Classic – A Translation of the Nei Gong Zhen Chuan, p. 3. Nei Gong: The Authentic Classic – A Translation of the Nei Gong Zhen Chuan, p. 7. Nei Gong: The Authentic Classic – A Translation of the Nei Gong Zhen Chuan, p. 23.